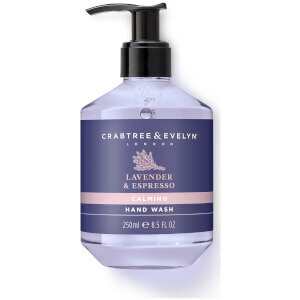 Cleanse and restore tired hands with the Crabtree & Evelyn Lavender Hand Wash; a delicate, gentle treatment composed with a host of natural ingredients. Transforming into a luxurious lather, the lightweight formula sloughs away impurities and dirt without stripping away moisture. An aromatic infusion of soothing Lavender, earthy Patchouli and dark Espresso promote a tranquil scent that lingers on skin, providing a welcome retreat for the senses, whilst hands are left feeling refreshed, balanced and restored.